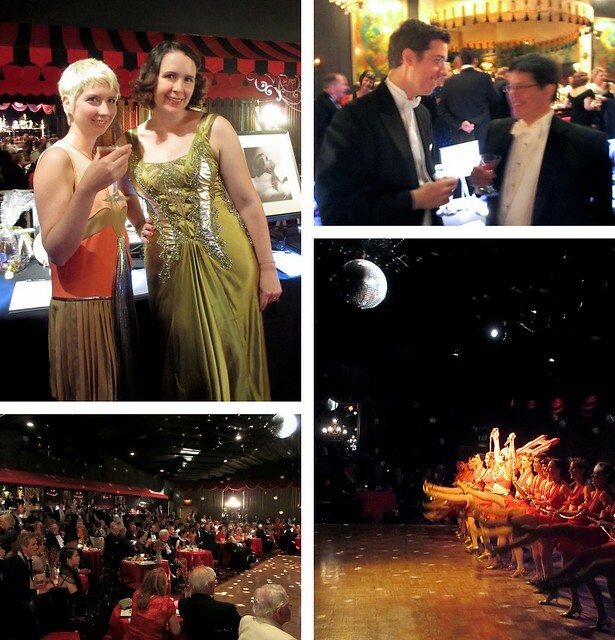 Once a year, the Art Deco Society of California puts on a fabulous deco-era ball. Pat and I went last year and had a fantastic time, so we just had to go again! Everyone dresses up in deco-era-style formal attire from the 1920s through early 1940s. Getting dressed for it last year was super easy because I already had a vintage gown from the late 1930s/early 1940s (pictured here), but this year I had to figure out what to wear. I started thinking about it early and created a Pinterest board for deco-era formal wear several months ago. Then I stayed on the look-out for a formal gown that would fit the theme – and finally found a gorgeous Mikael Aghal chartreuse silk gown at The Outnet. The bias cut and waterfall pleats at the waist were reminiscent of 1930s gowns, while the beading and embellishments evoked the 1920s. Arriving at the Art Deco Preservation Ball in a Mikael Aghal gown and vintage stole. Photo by Pat Zimmerman. But before we headed to the ball, Pat and I had dinner at Albona Ristorante Istriano, an absolutely delicious Istrian restaurant in North Beach. 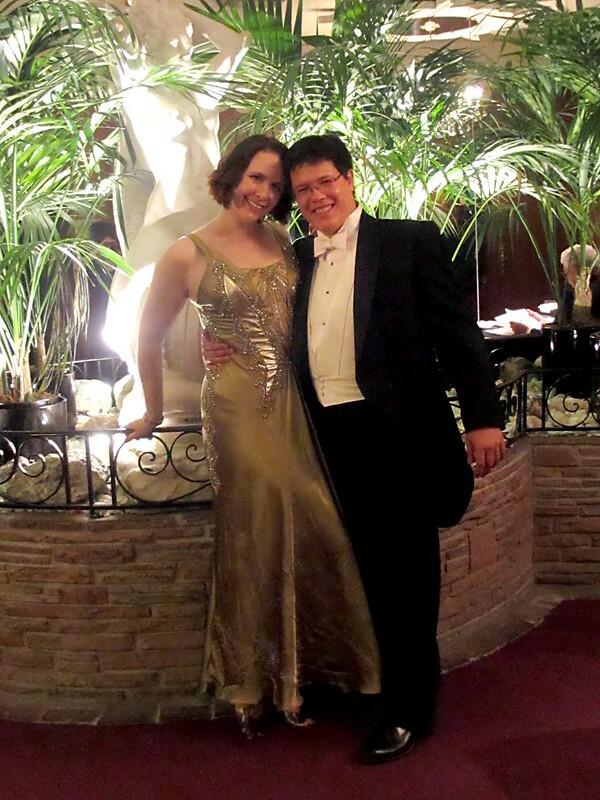 Pat looking dapper in a tux at Albona Ristorante Istriano. In pin curls at Albona Ristorante Istriano. Photo by Pat Zimmerman. 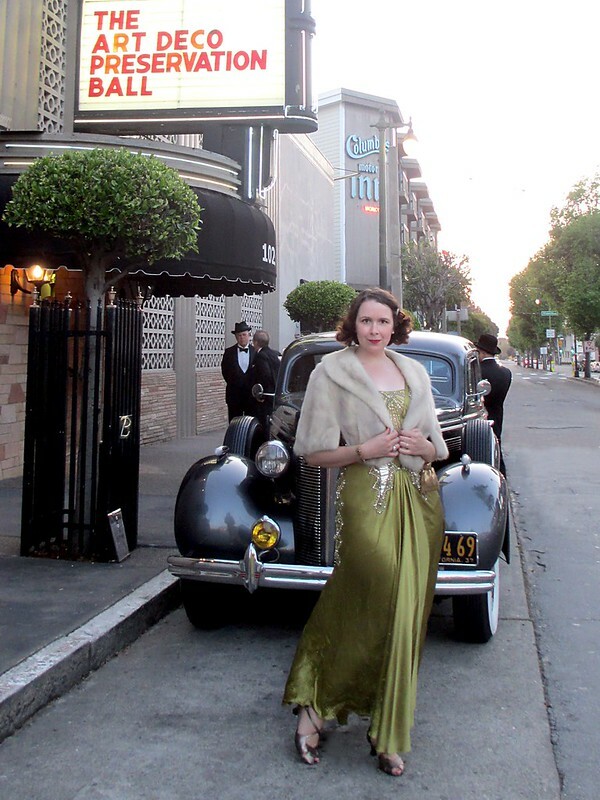 And then we headed to the ball, held at Bimbo’s 365 Club – a North Beach nightclub founded in the 1930s. In addition to having a marvelous time dancing, enjoying the live entertainment, and sipping classic cocktails, we ran into Susan & Eric Koger from ModCloth. Events are always more fun when you get to share them with awesome people! Clockwise from top left: with Susan (photo by Pat Zimmerman); Eric and Pat share a laugh; the Deco Belles; the crowd at Bimbo’s 365 Club. With Pat in the lobby of Bimbo’s 365 Club. Photo by one of the lovely ball attendees. 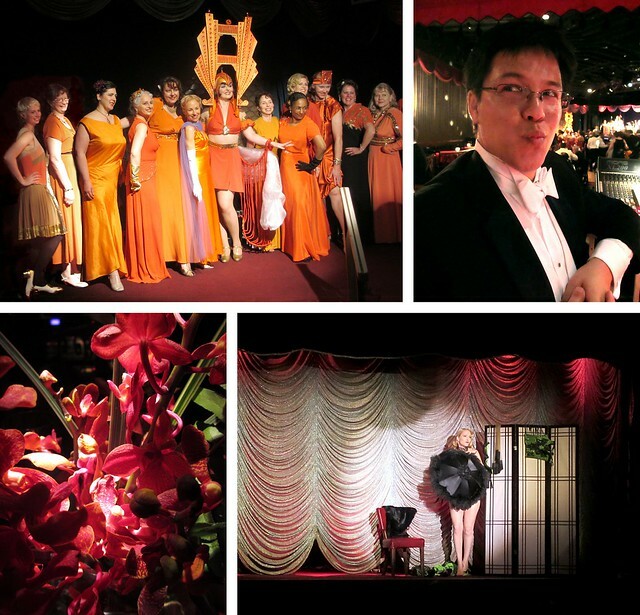 Clockwise from top left: Susan with other glamorous ladies in orange gowns – a photo-op to commemorate the Golden Gate Bridge; Pat looking… debonair? mischievous? ; Vienna La Rouge performing burlesque; a bouquet of orchids. 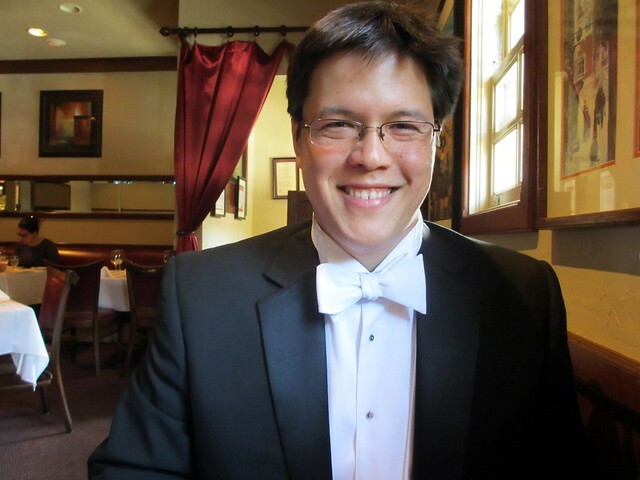 If you’re in the Bay Area and love the deco era, definitely check out the Art Deco Society! 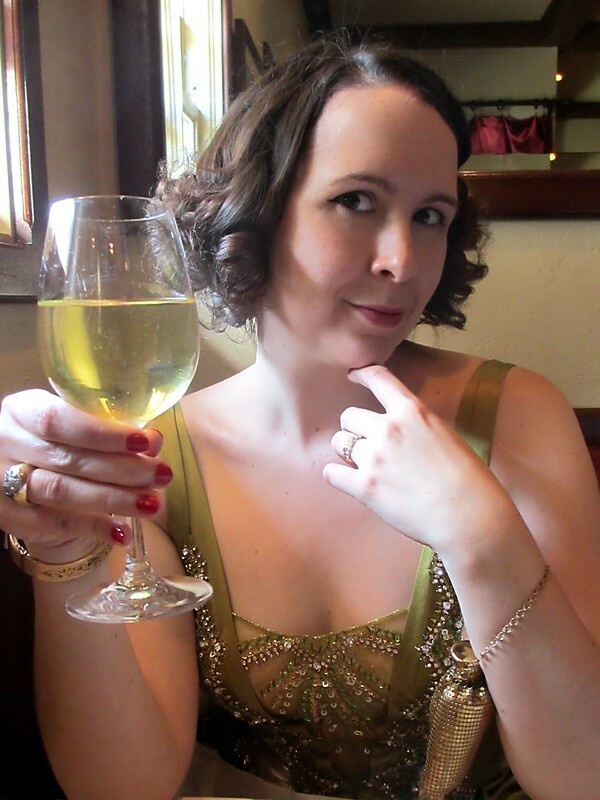 They put on a few events throughout the year, including a Gatsby-themed picnic in September (I went last year and plan to go again this year). And they also host walking tours of art deco buildings and publish information about related events put on by other organizations. Additional photos – and full-sized versions of the collage photos – available on Flickr, here. More will be uploaded in the next few days! Wow! you look stunning and fabulous! Such a beautiful shade of green. So stunning Kate! What a great opportunity to dress up and wear that gorgeous dress! Thanks Megan! And I thought so too. :) He was just proud that he has a real bow tie & knows how to tie it! Awesome article i was one who attended the ball with a large group of my friends they were the girls circleing with the horderve trays threw out the night and i had to find them all gowns. Thank you for sharing this, Kate, what a beautiful outfit and a nice event. I wish i lived in SF, Paris is so boring!! I am seriously just blown away by how amazingly awesome this event looks – I would love to be able to attend something like this! I had been wanting to attend a ball since I was a little girl (and wanted to be a princess – my feminist mother was appalled at the time!). The fact that this one is vintage-themed makes it super amazing. I recommend doing an internet search when you move – you might find something along these lines happening where you are!